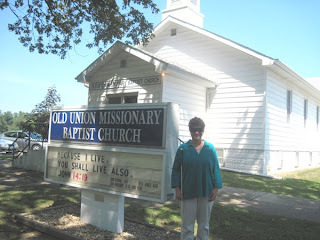 Here I am, outside of Old Union Missionary Baptist Church, Mt. Vernon, IL. 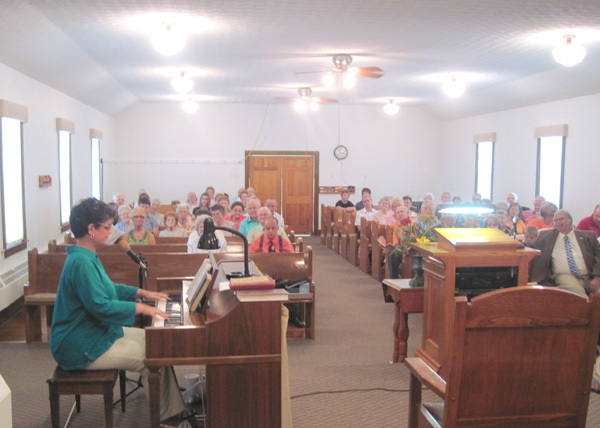 On Sunday, August 8, This congregation celebrated Homecoming. What a joy it was for Music By Laurel Jean to be part of this Sunday afternoon service, as the folks at Old Union marked over 60 years of fulfilling our Lord’s Great Commission in Mt. Vernon and beyond! The Old Union Homecoming was just one of several Music Ministry stops on the schedule during my most recent trip to my home state of Illinois. I flew into Springfield on Saturday, July 31. An Access Springfield bus, a service of Springfield Mass-Transit, took me to my hotel. On August First, I caught a cab to New Berlin, where I brought The Message In Music to God’s kids of all ages at New Salem United Methodist Church. 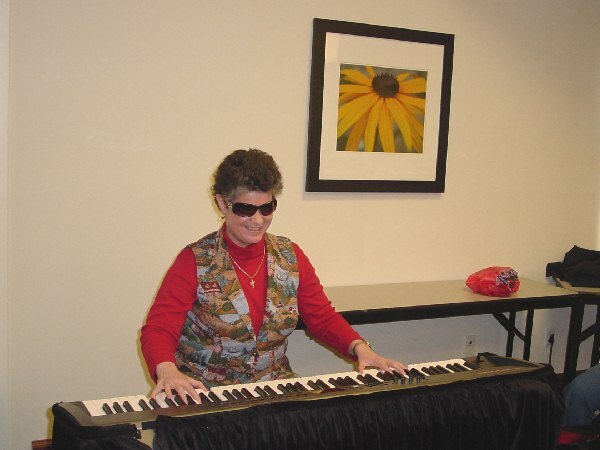 My good friend, Carolyn who often drives for me, had brought my piano to the church ahead of time, so everything was all set! 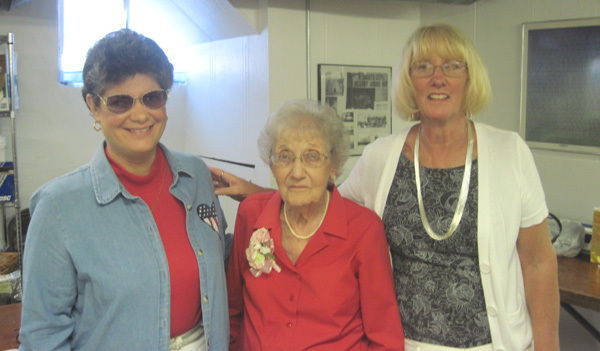 This day was extra special because it was the 90th birthday of Carolyn’s mom, Barb. After Morning Worship, Carolyn took her mom out to lunch while many of us stayed behind, moving my piano down to the basement fellowship hall and getting ready for a surprise birthday party! I had a great time providing background music for the party. Here I am with Carolyn and her mom. Other engagements included music for a special open house, and for the Dominican Sisters of Springfield, IL. Thanks to access Springfield, Lincoln Cab, and a couple of volunteers, I was also able to catch up with some of my long-time friends. 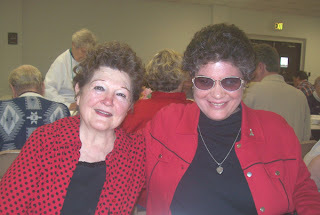 Millie, now 82, was responsible for both scheduling and driving me to my first ministry engagement, over 22 years ago! 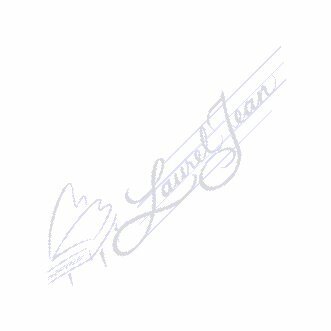 Though time and circumstances prevented us from staying in touch, we were reunited last year. Unbeknownst to me ahead of time, Millie attended my 2009 concert for the Lincolnland Chapter of Full Gospel Businessmen’s Fellowship International, where this picture was taken. On August 10, I was up early to catch another Access Springfield bus back to the airport for a very pleasant flight back to Charleston, SC. God still has more work for me to do, so stay tuned for more posts like this one. Thank God, and thank you, for your ongoing prayers and support! Until next time, God bless you, and keep His Song in your heart!